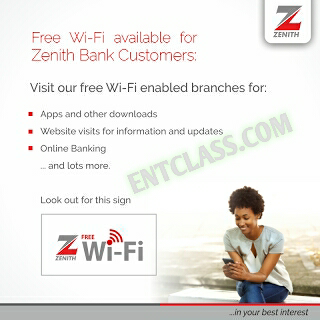 Though Zenith bank is not the first bank to launch free Wi-Fi browsing to its customers. This is a customized Wi-Fi connection. I'm sure by now, we know about the free Gtbank Wi-Fi connection at the University of Lagos (UNILAG) at Akoka. There is a garden there with place to sit with your phone or PC and browse comfortably. Am sure other Gtbank branch does same thing too. I can also remember Access Bank offers free wifi at their Alausa, Lagos branch. Am sure there are still other Access bank branch that also offers free Wi-Fi connection. Zenith bank is giving their loyal customers at some selected bank branches a free access to their Wi-Fi connection for them to download the Zenith mobile app, browse for information, access online banking, conduct online research and lots more. We have also installed a wide-range free Wi-Fi hotspot covering the Lagos University Teaching Hospital (LUTH) and its environs, to provide our customers within the hospital’s vicinity with free internet access. HOW CAN I BROWSE FREE WITH ZENITH BANK WI-FI? Inorder to use the Zenith Bank free Wi-Fi when you are in the selected bank branch, you will need to enter your Zenith Bank Account number as the password. HOW WILL I KNOW THE SELECTED BANK BRANCHES? Kindly download the list of Zenith Free Wifi branches HERE. It's in .pdf format.